These 034 Motorsport fully spherical, front upper adjustable control arms are for the B5, B6, and B7 A4, S4, and RS4 applications. These are the same arms that 034 Motorsport runs on their Time Attack A4. - Any track or race car. - Any car that requires wide ranges of alignment settings. - Utmost strength and durability, as well as serviceability. - Zero deflection and slop, compromised suspension geometry. - Highly accurate steering feel and input. These arms cannot be safely run at stock length (as shipped) as this would not allow any inward adjustment for increased camber. If you need to run stock length let us know at the time of order and we will supply a kit that can be installed as such. Dust boots are now included with all adjustable upper control arms. We ship the boots uninstalled. Once you have the alignment set, install the dust boots before final installation. Note 1 - This upper control arm kit does bind at full lock, the rear heim can touch the front link (depending on alignment settings), though this has no real effect on function (the wheel will turn all the way to the steering rack lock), we do not recommend driving around at full lock with these parts installed. Note 2 - Small diameter racing springs are required, stock diameter springs will hit the links, anything on your average KW V3 or Stasis Ohlins kit should clear the links. 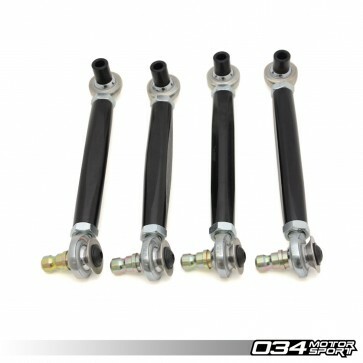 034Motorsport Density Line lower control arms are available as an option below. Tie rod ends and a complete upper and lower hardware kit are available as well. How much can I adjust negative camber? I would like to adjust 3 degree of negative camber. You should be able to achieve -3 Degree Camber without issue with these control arms. However max usable camber adjustments can vary depending on your setup.